‘Do you know what a saint is? A saint is one who is wholly given up to God.’ “The voice is so real as if someone is talking to me face to face. The question stirs my heart.” This is the beginning of the conversion experience of Freeborn Garrettson. Born on the west side of the Chesapeake Bay at the mouth of the Susquehanna River in Maryland, Freeborn is the third generation to settle in the low-lying stretch of land at the Northern portion of the large body of water. The actual location is Bush River Neck. A large amount of land, a farm, a general store and a black smith shop make the Garrettson estate an exceptional property. In addition, the various business establishments of the Garrettson family are run by slaves. 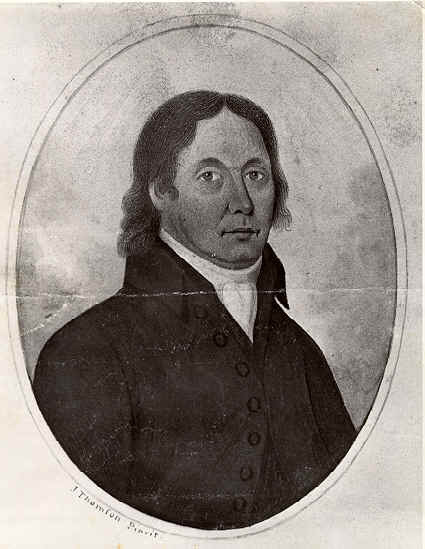 Born in 1752, (7 years younger than Francis Asbury), Freeborn’s wealthy Anglican family instills in the young man above average and proper educational, religious and social principals. His instruction is consistent with America’s early well-to-do farmers and landowners, besides the basics, Freeborn spends his school time learning mathematics as an aide in grasping bookkeeping. Surveying and astronomy is also a vital portion of this affluent preparation. Uniquely, it is the study of the planets and stars that seems to drive his quest for philosophical and spiritual significance. The audible request encounter mentioned at the beginning of this page is not the first divine event for Freeborn. Just prior to the question of knowing what a saint is, at the age of nine he experiences the question, ‘Ask and it shall be given you.’ Much like Joseph in the Old Testament, an additional experience causes him to race home to tell his siblings that he is going to be wealthy someday. After his ‘knowing what a saint is’ episode, he writes in a journal that he ‘saw such a person, the most beautiful of any I had ever beheld, I… prayed to the Lord to make me a saint.’ Is Freeborn a mystic? These experiences seem to point to an extraordinary child. He admitted that these voices he heard were audible. Shortly after these happenings at the age of 10, he faces a most unfortunate tragedy; he loses his mother, Sister Sally, and two family servants. These developments usher in a sensitivity to depression and melancholy. His spiritual yearnings awakened by the unique audible events will lie dormant for nearly ten years. Years later, the preaching of Robert Strawbridge and Joseph Pilmoor serve to awaken the spiritual yearnings in Freeborn. Free’s leaning in the direction of God is not complete until the active mentoring of Francis Asbury. By 1776, Freeborn is one of Asbury’s itinerants. Just like his childhood, his ministerial life is also marked with incredible events, divine interventions for protection, signs and wonders, on one occasion he is about to hang by several colonials that believe he is a Tory. Their midnight kidnapping of Freeborn and their subsequent delivery to a hangman’s noose in the middle of the Maryland forest divinely interrupts by a lightning strike that sends the attackers scurrying away in fear. Freeborn Garrettson escapes his attackers without a scar. 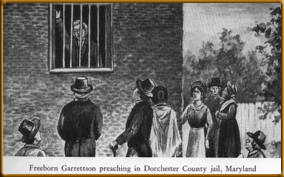 Freeborn Garrettson is one of Asbury’s Biblical cavalry who spends time in prison for preaching without a Maryland license. Under the authority of an abusive jailer, the warden erupts upon his discovery that the towns people are feeding Garrettson through the jail window where he is daily holding church services. Freeborn’s greatest leap of faith involves the freeing of his father’s slaves. The event causes strife within the family. It also opens the door for an 18th Century version of ‘Crockett and Tubbs,’ the famed pair from Miami Vice. Freeborn Garrettson and Harry Hosier, despite their antagonistic backgrounds, travel, and minister together. Their work in New York, not only is remarkable, but it is also recorded in the local newspapers. More on that in The Asbury Triptych Series.